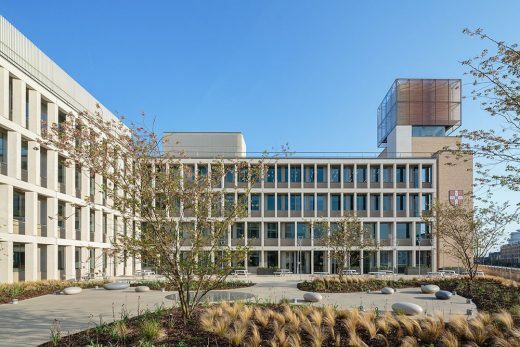 Known as The Triangle Building, the new 360,000 sq ft building will accommodate the growth of the company from 2,500 to 3,000 employees and consolidate office space previously housed in eleven locations around the city onto one site, bringing all Cambridge-based staff under one roof. 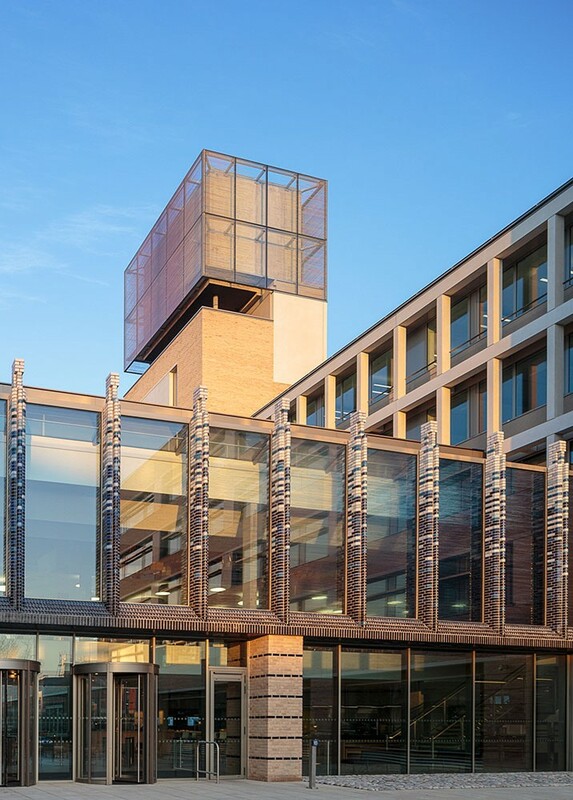 The Triangle Building underlines Cambridge Assessment’s continuing commitment to the city of Cambridge’s development as a centre of educational excellence in the global market. ‘‘Cambridge Assessment is one of the world’s most-respected education institutions. Our new headquarters, The Triangle Building, provides an inspiring, stimulating and uplifting workspace in surroundings that are commensurate with the international stature and ambition of the organisation. 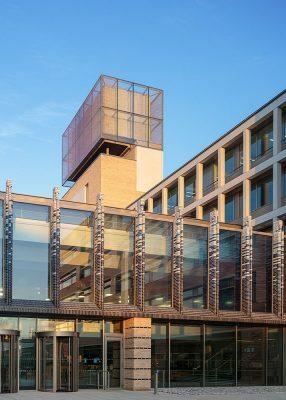 Eric Parry Architects’ brief was to create a new headquarters that would allow Cambridge Assessment to grow, while bringing its projected number of 3000 staff together into a single building. The triangular site that gives the development it name is located towards the southern fringe of Cambridge, bordered by the railway line to the east, large-scale offices and the printworks of the Cambridge University Press to the south and west, and new build housing, including the Stirling Prize-winning Accordia development to the north. In response to this mix of contexts The Triangle has been conceived as a series of interconnected buildings, divided into two main blocks either side of a generous open space, linked by a bridge-like block that divides the open space into an entrance plaza facing the street and a private garden beyond. Access to, and views of greenery were a key request made by staff during early consultation on the project. The Triangle retains mature planting on site well as integrating new hard and soft landscaping developed by Eric Parry Architects and Landscape specialists Grant Associates. The double-height space of the reception hall sits beneath the bridge, marked out by fullheight glazing at ground level and topped by a series of columns that terminate in stylised pinnacles, clad in glazed bricks in a pattern that ranges from indigo to cream. In its response to the surroundings and its palette of brick glass and pre-cast concrete, The Triangle recalls the typology of institutional buildings of the mid-twentieth century, with Alvar Aalto’s National Pensions Institute in Helsinki providing a particular source of inspiration. The building’s narrowest point forms a prow that faces the arrival of trains drawing into the city from the south. The sense of creating a landmark recognisable from the railway line is emphasised by an elegant, sculptural tower, which faces onto the railway, rising 39 metres to terminate the c-shaped block that begins at the prow. The tower provides accommodation for meeting rooms and its glazed upper storeys are subtly illuminated at night, creating a recognisable beacon. Eric Parry Architects commissioned artists Claire Obussier and Vong Phaophanit to design a site-specific installation made up of layers of script printed in ceramic frit onto the glazing of the entrance and the tower. Designed to be viewed from the exterior of the building as well as the interior, the script is made up of more than 300 responses, in 34 languages, to the question ‘What is Knowledge?’. Close-up the script is readable but from the distance that most people will view it the words merge together to form two abstract pieces of art called ‘In Other Words’. 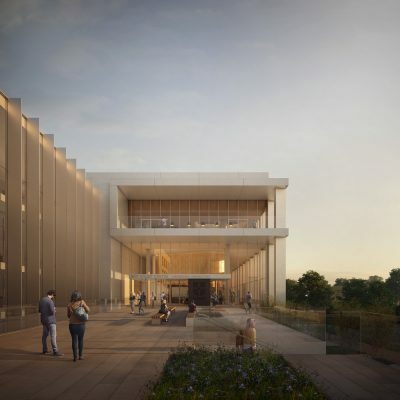 To the north of the central plaza, the building takes an ‘E’ shape, with three fingers of office accommodation separated by landscaped gardens on the roof of a single storey podium – a form that mitigates any potential for loss of light to the residential buildings to the north. Designed by Grant Associates, these gardens offer outdoor space for lunch breaks and spontaneous staff interaction. The design team includes Bouygues UK as contractor, and Ramboll as structural engineer. 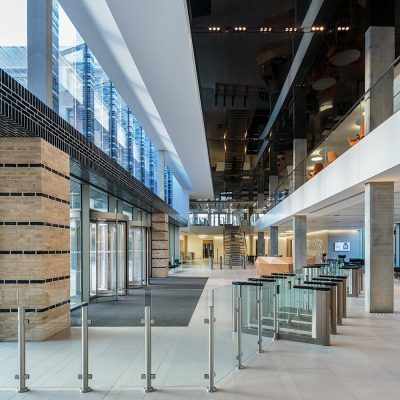 Max Fordham has worked as the Mechanical and Electrical (Building Services) Engineers, BDP have completed the interior fit-out, Grant Associates as Landscape Architects and Turner & Townsend as the Project Manager. Sustainability was a key consideration in the development of the site. 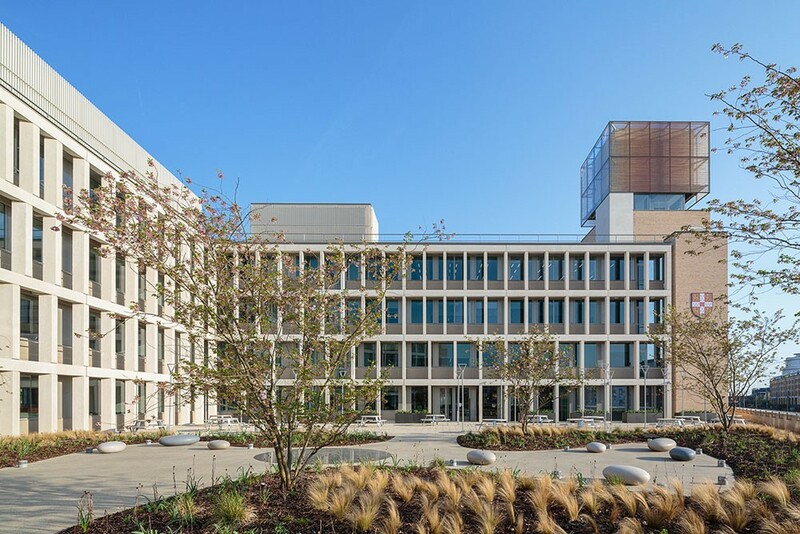 The building has been designed to provide long-term flexibility, energy efficiency and ease of maintenance and is targeting a DEC A rating when in occupation. ‘The Triangle will provide 1000+ cycle parking spaces for 3,000 occupants with car parking limited to 187, and 48 motorcycle bays as part of a sustainable travel plan’.